This week, I take a slight detour to tell you about one of the best books I’ve read in a long time. It’s called Meet the Frugalwoods. I first learned of the Frugalwoods back in 2014, almost four years ago (since the Frugalwoods are no longer anonymous, I’ll occasionally refer to them by their first names, Liz and Nate). Liz had left a comment on one of my posts. I had never heard of her blog, so I clicked over to take a look. The post that I came across was about refinishing kitchen cabinets and I was blown away. The post was well written, informative and had great photography. I knew that Frugalwoods were going to be big. Liz and Nate have come a long way since. The Frugalwoods blog is a smashing success and they have departed the city for Vermont. 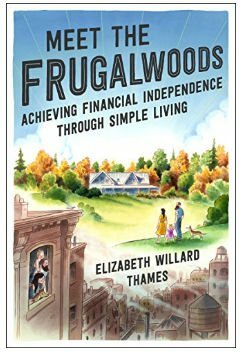 And this week, Liz’s book, Meet the Frugalwoods launches. This post is about that book. Or it will be eventually. And if you want the short story, the book is great. Go get it now. If you want the long story, read on. My favorite kind of writing is when the author’s personality shines through. With some writers, you feel like you’ve been friends with them just by reading their words. This was the case with Liz and I had definitely built her up in my mind’s eye. Her writing is thoughtful, warm and gracious. Would she be the same person when I met her? It turns out that I had nothing to worry about. I felt comfortable with Liz and Nate from the start, an accomplishment for a deep introvert like myself. After that first conference, we all continued to chat occasionally. Liz and I collaborated once in a while and Nate helped me design a bookcase. When we weren’t fixing toilets, we were enjoying conversation, fine microbrews and the Vermont countryside (wait, is any part of Vermont not country?). Before arriving, I had built up an image of the Frugalwood’s bucolic existence. It was every bit as great as I expected. The Frugalwoods have made a fantastic life for themselves. I bought a shortcake from the library’s strawberry shortcake fund-raiser and settled in on the lawn with friends to watch the parade. Stella was soon swooped into the arms of one of our neighbors and I chatted with another mom I’d recently met. With a siren blast from our volunteer fire department’s truck, the parade was underway. All the kids in town led the parade riding bikes they’d decked that morning with ribbons, stickers, and balloons. There was also a contingent wearing what I assume were last year’s very patriotic Halloween costumes: an Abe Lincoln, a Lady Liberty, and a dinosaur wearing an American flag hat. Our local state rep and his wife drove in their truck and waved. The parade was all of five minutes long, but the cheers were riotous. Afterward, the kids recollected the candy they’d thrown to the parade spectators (aka their parents and the other adults in town). Stella and I met up with Nate, who’d completed his tent-setting-up duty and was getting ready to chicken haul, which as it turned out meant toting chickens from the outdoor roaster inside to the kitchen for the luncheon. 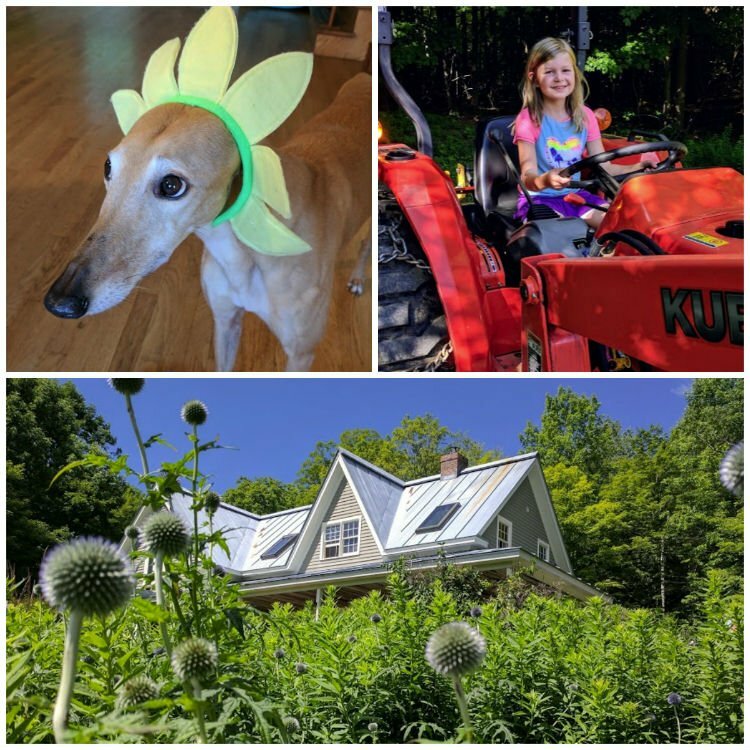 We’d lived in Vermont for barely two months and we already knew more people and had a more gratifying community life than we’d ever had in the city. If that doesn’t paint the best-ever Norman Rockwell picture in your mind, nothing will. Humor: A dimension that I hadn’t noticed much before is Liz’s sense of humor. Some parts of the book had me laughing like a nutter (the proposal scene!). The people sitting next to me on the plane probably thought I was a little crazy. Baring it all: Liz doesn’t hold back. In parts of the book, she lays her vulnerabilities and insecurities out for the world to see. I appreciated the honesty. Education: The book largely focuses on the Frugalwoods story, but Liz also weaves financial education into the mix. It’s not the primary focus, but I’m glad she included it. The book is a wonderful starting point for those just beginning to invest. Inspiration: The greatest joy I get from blogging is when someone tells me that I inspired them. If you can read this book and not be inspired, you don’t have a heartbeat. Liz has already changed many lives with her blog. This book is going to change a lot more. I’m sorry Millionaire Next Door, but this is going to be my default gift for college graduates now. And I bet that in a year when I Google “top 10 financial books,” I’ll see Meet the Frugalwoods in the results. But maybe I’m not thinking big enough? Is this book really about finances? It is and it isn’t. The undercurrent of Meet the Frugalwoods is frugality, but it’s really an example of how to properly live life. And that’s what makes it so good. No one needs another book that explains compound interest or index funds. There are enough of those already. What makes Meet the Frugalwoods so special is that it’s a story of two people getting their life together that happens to teach a money lesson too. And Liz, know how happy Mindy and I are for your success. Also, please see the asterisk below; it’s very important. Mrs. Frugalwoods recently posted…Reader Suggestions: What To Pack For Lunch (And How To Remember It)! You can call me “TG” for short! You’re far too kind, but I’ll take all of your compliments anyway. Pre-ordered the book and cannot wait to read it!!! I have always enjoyed Liz’s writing and following along with their journey, so this book is on top of my reading list for the year! What I love about these two is they’re taking the journey with the added payload of KIDS. It makes the adventure much more exciting, but also a lot more taxing and complicated. I can’t wait to get my hands on this book! Frugalwoods is definitely one of my favorite blogs. I love it because they are frugal and so am I. I particularly like the Reader Case Study posts! Frugalwoods is one of my favorite blogs as well. We both own Kubota tractors so how could I not like it? But I’m worried about reading “Meet the Frugalwoods”. I had just started to come around to the idea that we’ll probably stay in NC once we FIRE and then I read the quoted passage above. I’m afraid reading the book will have me rehashing the whole Vermont vs. NC debate in my head all over again. Toilet Guy – what should I do? I’ll be looking for your clogged john signal in the night sky to provide guidance. Vermont was incredibly beautiful. No billboards. 100,000,000,000,000,000,000 trees. Rolling hills. Green everywhere. I placed my pre-order the moment Liz announced it and Amazon says it will be delivered tomorrow! Carl, if you’re ‘the toilet guy’, it makes all the potty humor work related and tax deductible! And yeah, the Vermont toilet fixin’ was like a trifecta of potential for me (plumbing skills + foul humor + business expenses)! This is such a great review! You told a wonderful story without giving much away. I gotta read this book now. Thanks for the recommendation! I’m super excited to read this book, a family pre-ordered it for me as a Christmas gift and I have been impatiently waiting for 3 months! While I haven’t yet read her book, I’ve followed Mrs. Frugalwoods for years. She’s definitely a great writer and her perspective is refreshing in a world of “go buy this index fund and buy my book” blogs. Very cool that you guys were able to meet up. A great endorsement for a book I was already 100% going to read. Can’t wait to get my copy! Gotta get the book. Don’t know if I can get Mrs. 39 Months to go “back to the land” but it should be a great read. Glad you were able to fix their toilets. I just downloaded my copy and I’m super excited to read it! Also, potentially hire your kids to have cameos and then stuff their earnings into an IRA? It seems to be all the rage nowadays!